Make brownies according to package directions. Cool and cut into 1 inch cubes. Place 3/4 cup of cool whip into a zip lock or pastry bag and set aside. Chop 1/2 of the chocolate bars. 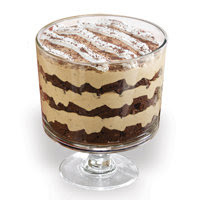 Combine coffee liqueur, water and instant coffee in a medium bowl until dissolved. In a large bowl, whisk cream cheese until smooth. Gradually add coffee mixture, mix well. Add pudding mix and whisk until mixture begins to thicken. Fold in remaining cool whip and chopped chocolate, set aside. Place 1/3 of the brownie cubes in a trifle bowl (baking dish will work too). Layer with 1/3 of the filling. Repeat layers two more times. Pipe reserved cool whip over the top. Grate remaining chocolate over trifle.